Listed is an absolutely gorgeous and rare, 1970s Italian hand painted tole topiary. Pictures do not do this life-sized sculpture justice, it's truly a stunning piece, standing tall at 6ft 6in. The black and gold footed planter measures 13.25 W x 13.25 D x 15.25 H and has gold rings on all four sides. Marked 'Italy' on underside, see last photo. Heavy, weighing nearly 50lbs. 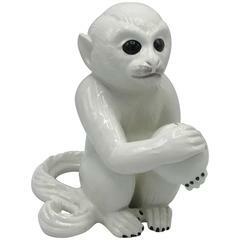 Offered is a stunning, 1970s Italian ceramic monkey sculpture. Marked on underside. Offered is a fabulous and rare, life-sized 1960s Italian brass heron sculpture. Heavy. Stands nearly 4ft tall! Offered is a fun and modern, 1970s Italian green tinted-resin owl sculpture. Includes original 'Italy' tag on underside, see last photo. 1970s French bronze fountain sculpture of cherub with duck, with water spout on its beak. A beautifully carved Italian Carrara marble sculpture of a boy adorned with lions skin cape playing the flute. Provenance: Black Rock Connecticut Waterfront Estate.